Danny Coker purchased Discount Battery in Taylorville, IL from Rex Curtsinger in 1985 with annual sales of $200,000.00. In 1987 he purchased the present location 800 Springfield Rd., Taylorville, IL and changed the name to Battery Specialists. 1991 ~ Danny purchased Lovin Distributing, a battery wholesaler, in Mt. Vernon, IL. 1992 ~ Kevin Coker moved to Mt. Vernon and opened the retail side of Lovin Distributing naming it Battery Specialists. 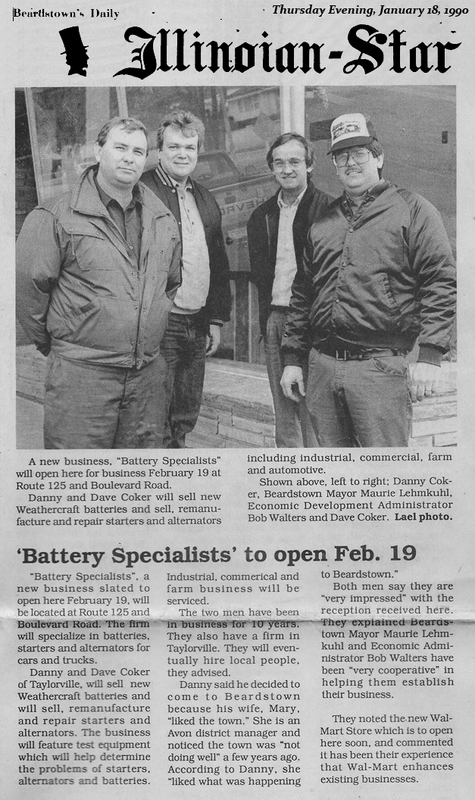 1996 ~ The company was changed from a sole proprietorship to Coker Family, Inc., Dba Battery Specialists. 1997 ~ The name was changed to Battery Specialists + Golf Cars as we started Golf car sales, service, and leasing. 1999 ~ Battery Specialists + Golf Cars was named Club Car Distributor for 80 counties in the state of Illinois and also dealer for the CarryAll Commercial line. Locations for the golf division were added in Mt. Vernon and Champaign, IL. We were also named as an authorized Power Wheels Service center. 2000 ~ Battery Specialists + Golf Cars received the Superior Market Penetration Award from Club Car, Inc. This was achieved in its first year as a Club Car Distributor. 2001 ~ Battery Specialists + Golf Cars received for the 2nd year in a row the Superior Market Penetration Award. This is the first time in Club Car's history that a distributor has received this award consecutively. 2002 ~ Battery Specialists + Golf Cars reached over $6 Million dollars in sales. 2005 ~ Battery Specialists + Golf Cars expanded the Taylorville location with a new showroom and warehouse. 2006 ~ Battery Specialists + Golf Cars received the 5000 units purchased award from Club Car, Inc.
2008 ~ Battery Specialists + Golf Cars add a Highland, Illinois as another location. Company also reached 9 million in sales. 2009 ~ Battery Specialists + Golf Cars won Club Car XRT Dealer of the year. 2010 ~ Battery Specialists + Golf Cars becomes an LSV Dealer. Battery Specialists + Golf Cars the 2010 Club Car Distributor of the year. 2011 ~ Battery Specialists + Golf Cars received the Superior Aftermarket Performance award. 2012 ~ Battery Specialists + Golf Cars was named the 2012 Club Car Consumer Dealer of the Year. 2013 ~ Battery Specialists + Golf Cars added the Streamlight flashlight products to its portfolio. The company achieved over 10M dollars in yearly sales and received the 10,000 unit award. 2014 ~ Battery Specialists + Golf Cars became a Club Car Black and Gold Distributor, Developed a Special Events Program SEM and began selling programs to other golf car dealers. 2016 ~ Battery Specialists + Golf Cars added Farm Progress Show in Boone, IA to its portfolio of special events. 2017 ~ Battery Specialists + Golf Cars was named Club Car Elite Black and Gold Partner. Only 10% of Club Car's Distributors are awarded this honor. This is Battery Specialists + Golf Cars 1st time as Elite partner and 2nd time as Black and Gold Partner. 2018 ~ Battery Specialists + Golf Cars added EZGO to their product lines. PTV's (Personal Transportation Vehicles) were added in all locations. Named Club Car Elite Black and Gold partner a second year in a row. Battery Specialists + Golf Cars is an Authorized Club Car Distributor and EZGO Dealer. Battery Specialists + Golf Cars now has a sales portfolio including: batteries for everything, starter and alternator repair and rebuilding, an authorized Power Wheels service center and golf car sales, service and leasing. We have 4 facilities in Illinois to serve you and a staff of 35 employees, 4 service vehicles, 12 delivery vehicles and 20 trailers. Our company is serviced based and that is why we believe we have experienced such tremendous growth. Our company's mission statement is to deliver quality products and excellent service at a reasonable price.